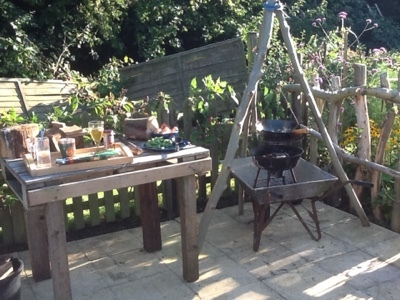 Cooking chicken curry in the garden. The wheelbarrow holds a barbeque fire pit. Suspended from the ash branch tripod is the top grill section from the bbq set raised above the fire by chains from a hanging basket and some thick galvanised wire. This holds a wok and can be raised or lowered up of down depending on the fire beneath. Once cooking complete the wheel barrow and fire pit can be moved from under the tripod to enable a larger fire to be created for evening warmth (and not burning the tripod).